Did you ever start a club of your own? When my daughter took Russian in high school, I thought her homework looked like fun. So when an evening class was offered at her school, I jumped right in. Learning to use the Cyrillic alphabet was a challenge -- like writing in code! I thought, "This is so cool -- kids would love it." Then an idea hit: Why not start a club for American and Russian kids? So I did. By good luck, a Soviet traveling exhibition was visiting Orlando at that time. A magazine editor with the group promised to announce the club in her magazine back in Moscow. So a friend and I set up club Druzhba on the computer, and the adventure began. books. As an afterthought, Tara added, "A dancer would be nice," and the idea for Future Perfect was born. The club lasted for eight years. By that time, most of the kids had grown up -- the teen members had moved into their twenties! 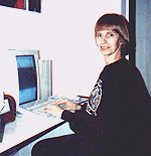 Several of the friends I made still write -- you can meet them on my Pen Pals page. You can also try learning a little Russian, as Tori does in Future Perfect.